The debut of the first-generation iPod touch in 2007 was a major change for the entire iPod line. For the first time, there was an iPod that was more like the iPhone than the iPod nano or iPod Video that had come before. There was good reason that the iPod touch was referred to as "an iPhone without the phone." Over the years the iPod touch has evolved from a fun, but limited iPod to a powerful device that could almost replace an iPhone for some uses. This article tracks the evolution of the iPod touch by covering the history, features, and specs of every generation of the iPod touch. The iPhone ​had been out about 18 months when the first iPod touch was released. The iPhone 3G had debuted a few months earlier and, by this time, Apple knew it had a hit on its hands with the iPhone. It also knew that not everyone wanted, needed, or could afford an iPhone. To bring some of the best features of the iPhone to the iPod, it released the First Generation iPod touch. Many people referred to the touch as an iPhone without the phone features. It offered the same basic design, a large touchscreen, Wi-Fi Internet connectivity, and iPod features including music and video playback, wireless music purchases from the iTunes Store, and ​CoverFlow content browsing. Its chief differences from the iPhone are the lack of phone features, ​digital camera, and GPS, and a smaller, lighter body. The Second Generation iPod touch was distinct from its predecessor due to its redesigned shape and a host of new features and sensors, including a built-in accelerometer, integrated speakers, Nike+ support, and Genius functionality. The Second Generation iPod touch had the same shape as the iPhone 3G, though it was thinner at just 0.33 inches thick. Like the iPhone, the 2nd gen. touch included an accelerometer that senses how the user is holding or moving the device and allows content on the screen to respond accordingly. The device also included the Nike+ exercise management and tracking software system (hardware for Nike shoes needs to be purchased separately). Unlike the iPhone, the touch lacked phone features and a camera. In most other ways, the two devices were very similar. The 3rd Generation iPod touch was met with a somewhat tepid response at its initial introduction because it offered only slight improvements over the previous model. Based on rumors, many observers had expected that this model would incorporate a digital camera (it later appeared on the 4th generation model). Despite that initial disappointment in some corners, the 3rd Generation iPod touch continued the line's sales success. The 3rd gen. touch was fairly similar to its predecessor. It distinguished itself due to its increased capacity and faster processor, as well as support for Voice Control and VoiceOver. Another key addition to the third-generation model was the same processor as used in the iPhone 3GS, giving the device more processing power and allowing it to display more complex graphics using OpenGL. Like previous iPod touch models, this one lacked the digital camera and GPS features available on the iPhone. Discontinued: 8GB and 64GB models discontinued in Oct. 2012; 16GB and 32GB models discontinued in May 2013. The 4th Generation iPod touch inherited many of the features of the iPhone 4, significantly upgrading its display capabilities and making it more powerful. As with previous models, the 4th generation touch offered a 3.5-inch touchscreen, Internet access using Wi-Fi, media-playback features, multiple sensors for gaming performance, and App Store support. Unlike the iPhone, which is updated every year, the iPod touch line hadn't been updated for two years when the 5th generation model was unveiled. It was a big step forward for the device. Every model of the iPod touch has looked a lot like its sibling, the iPhone, and inherited many of its features. While the 5th generation touch does share many features with the iPhone 5, the two devices don't look completely alike, thanks to the introduction of colored cases to the iPod touch line for the first time (previously the touch had only been available in black and white). The 5th generation iPod touch was also thinner and lighter than the iPhone 5, by 0.06 inches and 0.85 ounces, respectively. New, larger screen: Like the iPhone 5, the 5th generation iPod touch sported a large, 4-inch screen. Like the iPhone, the touch got taller, but not wider, changing its resolution to 1136 x 640. Thanks to that resolution, the iPod touch still offered a Retina Display screen at 326 pixels per inch. Apple A5 processor, the same as used in the iPhone 4S and iPad 2. Lighter, thinner: The 5th generation touch was 0.04 inches thinner and weighed 0.46 ounces less than the 4th generation model. Lightning connector: This generation is the first iPod touch model to use Lightning, Apple's replacement for the earlier Dock Connector. Lightning is smaller and thinner than its predecessor, and it is reversible, so it doesn't matter which side is facing up when you plug it in. Loop: A new accessory for the iPod touch. This small fabric loop attached to the back of the touch and went around the user's wrist to secure it to their body. The loop was included with every 5th generation touch and was color coordinated with the color of the touch's case. EarPods: The touch shipped with Apple's new, redesigned earbuds, called EarPods. They were intended to better fit in the ear, not fall out, and deliver better sound. Siri: Previously limited to just the iPhone 5, the iPod touch supported Apple's voice-activated digital assistant, Siri. Passbook: A new app that collected e-tickets, gift cards, coupons, and other items that can be used in stores and at events. Employees simply scanned barcodes in the app to give the user their ticket or discount. 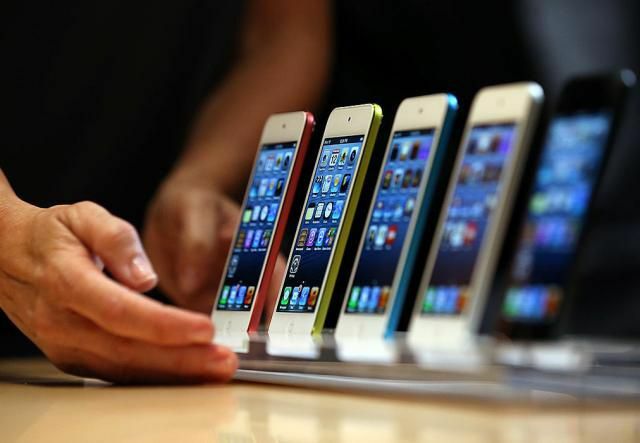 In the three years after the 5th Generation iPod touch was released, and with the continued runaway growth of the iPhone after the blockbuster introductions of the iPhone 6 and 6 Plus, many speculated that Apple wouldn't continue offering the iPod touch much longer. They were proved wrong with the release of the powerfully revamped 6th Generation iPod touch. This generation brought many of the hardware features of the iPhone 6 series to the touch lineup, including an improved camera, the M8 motion co-processor, and the A8 processor, a big jump from the A5 at the heart of the previous generation. This generation also introduced a high-capacity 128GB model. A8 processor: The same 64-bit chip was used in the iPhone 6 series, giving the touch more power. M8 motion co-processor: The touch could take advantage of the same movement data collection as the top-of-the-line iPhone models. 8 megapixel back camera: In addition to higher-quality images, included support for 43-megapixel panoramic images and 120 frames/second slow motion. Improved networking: This model supported the faster 802.11ac Wi-Fi standard and Bluetooth 4.1, as opposed to the 4.0 in the previous generation. 128GB model: The maximum storage offered by the touch now matched that offered by the iPhone 6 series. The 6th touch maintained features from the previous generation such as the 4-inch Retina Display screen, a 1.2-megapixel user-facing camera, support for iOS 8 and iOS 9, and more. It also had the same physical size and weight as its predecessor.